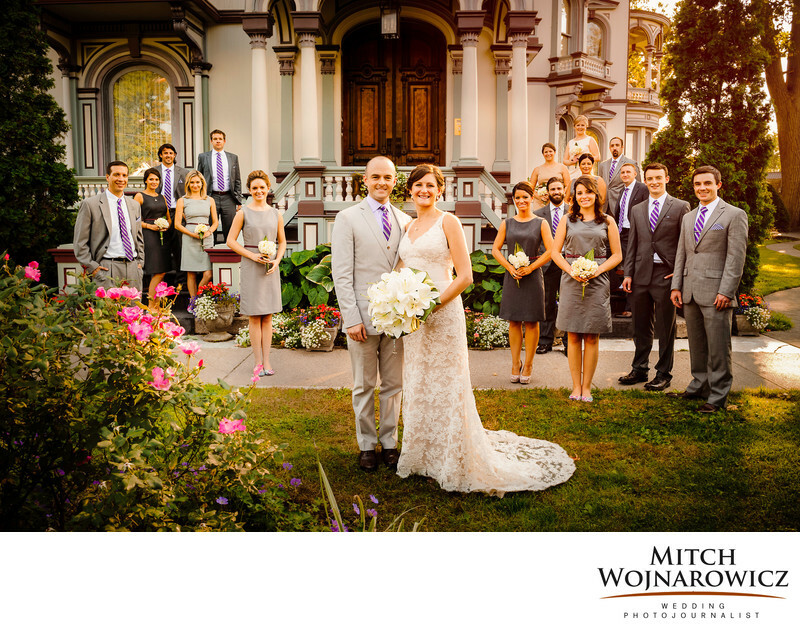 On a perfect late summer day, the wedding party gathers for a group photo during a Batcheller Mansion Inn wedding. Gathering the group in front of the beautiful Saratoga NY wedding venue, I used a favorite way of arranging them, making the group look natural and relaxed. While there was some beautiful late afternoon light that I took advantage of, there is a fair amount of extra lighting added to make the photo happen. You can’t make a photo like this if you’re only a natural light wedding photographer! The sunlight would be lost, or the detail in the building would go dark. Or even part of the wedding party would not be visible. As it is, I was able to preserve the details where I wanted them as well as keep the sense of the beautiful late afternoon light, streaming into the photo. Looking for the Best Saratoga NY Wedding Photographer? You do have to define a little bit what you mean by “best”. Wedding photography isn’t a commodity like a bushel of corn, where everything is equal. Photographers come in all different styles, shapes and sizes, ages and experience levels. Growing up in New England means I have a different way of looking at weddings in Saratoga Springs NY that someone who was born and raised here. They might take some small details for granted that a non native such as myself might find interesting. Some folks might want a wedding album full of posed photos, where every single photo was staged to make the couple look a certain way that was predetermined ahead of time. Some might want a full documentary wedding photographer, where posing is kept to a minimum. Still, an experienced Saratoga documentary wedding photographer such as myself will help you with extensive planning ahead of time so that we can still get some of those posed wedding photos that you’ll likely want. But with my planning and help, those won’t be all the wedding photos you’ll get. And you won’t spend hours away from your wedding taking them. You know, if you get in touch with me, I can give you a few links to show you many more wedding photos from this unique Saratoga wedding venue. I’ve photographed many weddings there and would be happy to share some of them with you. Can We Speak A Bit About Your Wedding? It would be nice to hear from you and to learn what you’re looking for in a photographer. Just Use This Link to contact me today and we’ll find a time to speak a littler about your wedding. No obligation and you won’t get pestered for reaching out. I’d enjoy helping you in this early stage of planning your wedding! Keywords: Batcheller Mansion Inn (6), saratoga springs (66).